Our organization is engaged in offering a comprehensive range of Putzmeister Stationary Concrete Pumps. These products are made at our end using the optimum quality material and advanced techniques. Available for Sale at Jaipur, Putzmeister Concrete Pump used for only 2 months, in good condition with Company warranty. I want to sell my concrete pump. 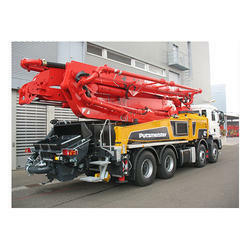 The Putzmeister trailer concrete pumps are based on technical pioneer achievements. They keep attaining new records in high-rise and long-distance conveying - and have been doing so for over 35 years!